India and France have planned eight to ten satellites as part of a constellation for maritime surveillance, French space agency CNES chief Jean-Yves Le Gall has said. This will be India’s largest space cooperation with any country, officials said. Additional information revealed that the launch of these maritime surveillance satellites will focus on the Indian Ocean, a region that has been witnessing increasing Chinese presence. France will also share its expertise with the Indian Space Research Organisation (ISRO) on inter-planetary missions to Mars and Venus, the Indian space agency’s two major missions, Gall said, who stated talks regarding this constellation of new satellites for maritime awareness will take time. The purpose of the constellation is monitoring sea traffic management, a CNES official said, adding that it would take less than five years to launch the satellites. In March of this year, India and France unveiled a joint vision for space, resolving to strengthen cooperation between ISRO and CNES. In a joint statement, ISRO and CNES stated they would work together for design and development of joint products and techniques, including those involving Automatic Identification System (AIS), to monitor and protect assets in land and sea. In particular, both sides will pursue the study of a constellation of satellites for maritime surveillance,. 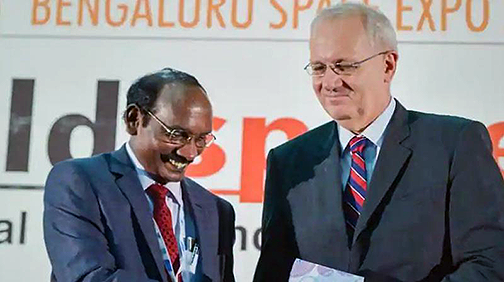 ISRO chairman K Sivan (left) and French space agency President Jean-Yves Le Gall during the inauguration of the 6th Bengaluru Space Expo 2018. Photo is courtesy of PTI. Several crucial sea lanes of communications pass through the Indian Ocean, a region critical to the strategic interests of India and France. While the Indian Ocean region is the prime focus for New Delhi, Paris has territories spread across the Indian Ocean, the Pacific Ocean and the Atlantic Ocean, officials said. The robust space cooperation between India and France goes back six decades. Last week, the two countries signed an agreement to share expertise on ISRO’s human mission program Gaganyaan. The space agencies of the two countries have also been working on climate monitoring on the joint missions Megha-Tropiques (launched in 2011) and Saral-Altika (launched in 2013). The two nations are also working on the Trishna satellite for land Infrared monitoring and the Oceansat3-Argos mission. Discussing collaboration for the mission to Venus and Mars and France’s expertise on the matter, Mathieu Weiss, the managing director of CNES’ India liaison office, explained that the eyes and scientific heart of Curiosity Rover (NASA) on Mars were developed by CNES. France and Russia have jointly worked for the Venus mission in the past. In both the inter-planetary missions, the French scientific community is strong and among best in the world. Gall also said last Friday that CNES is currently working with Japan Aerospace Exploration Agency (JAXA) and German space agency DLR on Hayabusa 2/ MASCOT, a mission to asteroid Ryugu. CNES has also scheduled Mission BepiColombo to Mercury.